Our shop is situated only a few hundred yards from the Grand Union Canal, the River Ouse and Bradwell Lake and we have tickets and tackle to cover them all. The Milton Keynes area caters exceptionally well for anglers with some wonderful waters both on day ticket and annual permit.? From small private fisheries to the vast expanses of Willen and Furzton Lakes and from the canal, which is still a favourite with many anglers, to the more challenging river stretches holding monster perch, some great chub and the ever elusive barbel. Our staff have tales to tell about all of these waters.? They are keen and experienced anglers and are more than willing to share their knowledge with you.? You are always welcome to come into the shop for a chat and a catch up with what has been going on! 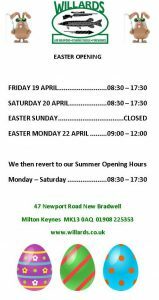 We have given you just a taste of what we stock here but come on over to see us either to replenish your tackle box, pick up your fresh bait, get your day-ticket or annual permit or if you just want to escape from home for a bit of a chat about where is fishing well. Here is one view of the fishing room… all stocked up! 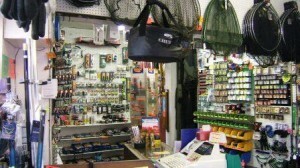 The picture to the left gives you an idea of what we stock, this is just a small snapshot of an area of the store showing you a selection of hooks (on the right of the picture) and?some of the nets we stock (top of the picture). Catering for all needs, from the young or novice angler to the more mature or experienced among you, we are here to help, give friendly advice and most importantly KEEP YOU FISHING! Here are some useful links which include the?clubs whose permits we sell?